A NEW IGFA all-tackle world record sevengill shark was caught aboard the California Dawn by Jonny Mathews of Stockton last week, and it weighed 322 pounds! 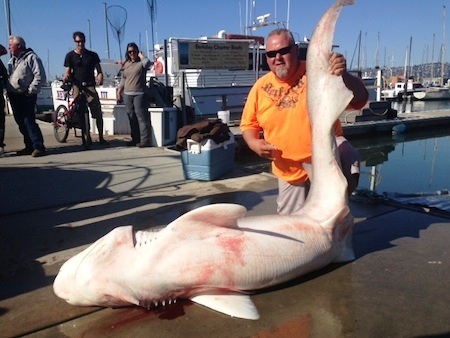 BERKELEY, Calif. -- The San Francisco Bay area is about to claim a new world record after a Stockton-based angler hooked a giant shark while fishing on the California Dawn on Friday. The big sevengill cow shark hit a whole salmon head for Jonny Mathews near Yellow Bluff in San Francisco Bay. "We were near the end of our tri and I gave a 10 minute warning," said Captain James Smith. "Jonny's rod started to bounce, moving up and down two feet at a time." Having caught and released over a dozen big sevengills, Smith knew the signs of one of the "big boys." Mathews set the hook, and after several long runs, the fish finally came up. "After discussing whether to release the fish, or seek the possibility of a new world record, we opted to bring the fish aboard," said Smith. "This is the biggest fish I have ever seen landed in my 30-year career," he said. They weighed the beast on a certified scale at 322 pounds. That beats the existing IGFA all tackle record caught in New Zealand by over 100 pounds. Mathews used an Okuma rod and Avet reel spooled with 150-pound test to subdue the oversized shark. In addition to the potential world record fish, the Cal Dawn's anglers caught 5 leopard sharks to 30 pounds and another sevengill. On Thursday, another shark trip on the Cal Dawn found 9 soupfin sharks to 75 pounds, 8 leopards to 38 pounds, and 2 sevengills to 150 pounds.